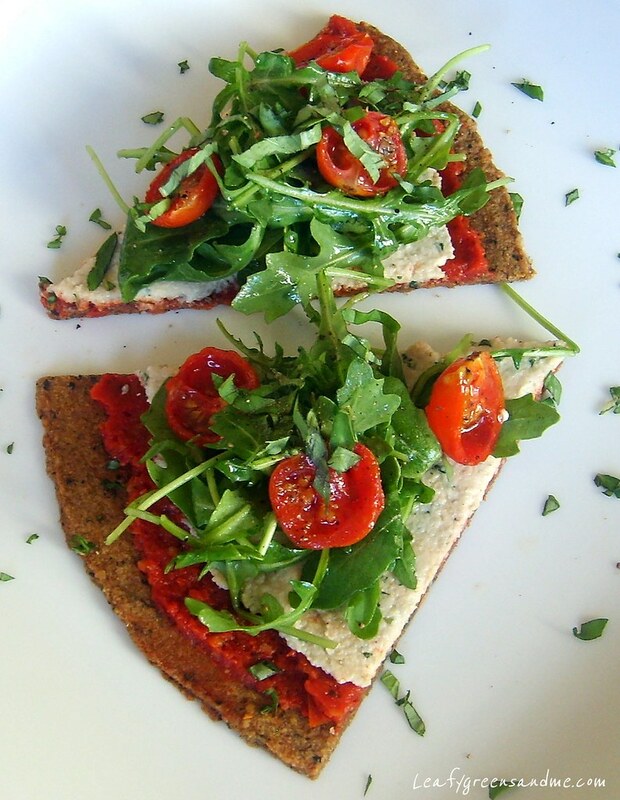 I recently checked out a book from the library called Everyday Raw by Matthew Kenney and decided to make his recipe for Tomato, Basil and Ricotta Pizza. I really liked the flavor and freshness of the pizza, but I felt the crust became a little soft once the toppings were added. This could be my fault because I rolled out the dough to a 1/4" thickness when the recipe recommended 1/2", or maybe it's because I don't have a dehydrator and I baked my crust at a really low oven temperature instead of dehydrating for 24-36 hours. Anyway, applying "raw" principles to food is still really new for me, but I'm starting to get the hang of it. Also, instead of making a Macadamia/Ricotta with nutritional yeast, I used cashew nuts with a mild miso paste and omitted the nutritional yeast entirely. I also added fresh basil as an added flavor component. For the sun-dried tomato spread, I added minced capers and dried Italian seasonings. I might try making the crust again or experiment with a baked gluten-free pizza crust and then add the raw toppings afterwards. Also the sun-dried tomato spread and the cashew ricotta would be great served on toasted bruschetta or crostini. Again, the flavors were great. It's really amazing how fresh ingredients taste when they are eaten raw and minimally processed. You can definitely taste the difference! Drain the cashews and place in a food processor along with all the other ingredients, except for the minced basil. Process until smooth and then place in a bowl and stir in minced basil. Blend all ingredients together in a food processor until smooth.